Susannah Harker as the ambitious journalist Mattie Storin. PLOT SUMMARY: As the episode opens, the Conservative Party wins a general election albeit with a reduced majority. 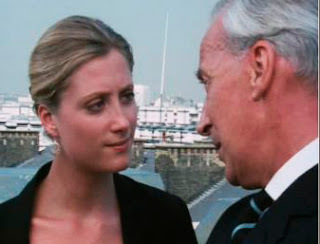 The Conservative Party Chief Whip, Francis Urquhart MP (Ian Richardson) is refused a promotion to Home Secretary, and urged on by his loyal and ambitious wife Elizabeth, begins to scheme to undermine the Prime Minister, Henry Collingridge (David Lyon). Urquhart uses ambitious young journalist Mattie Storin (Susannah Harker) to plant stories of dissension in the ranks and a potential leadership challenge. The front runner seems to be the young Jewish Environment Minister, Michael Samuels (Damien Thomas). Urquhart also demands the loyalty of the party's campaign manager, Roger O'Neill, in exchange for keeping his addiction to cocaine, and embezzlement of party funds under wraps. Finally, Urquhart opens a bank account with dirty money in disguise. COMMENTS: What strikes me about this episode is the depiction of all the prejudices that are especially British - class prejudice, anti-semitism and misogyny. It really is an unpleasant world to inhabit to an extent that the US remake doesn't approach. We see Urquhart as a man of privilege, shooting on his estate, and sense his profound sense of entitlement. Urquhart's wife is also far more of a Lady Macbeth figure than Frank Underwood's wife: she has no apparent career and pours her ambitions into him. Mattie Storin is also more of a sure-footed ambitious journalist than in the US remake. There are many lines and scenes that have been translated straight from the original series to the remake. Urquhart offers the addicted O'Neill a scotch, but doesn't take one himself, setting up O'Neill with the line that "it's a little early in the day for me". Underwood does the same to Russo. Similarly, O'Neill's secretary calling him pretending to be the Prime Minister becomes Christina calling Peter Russo. But the scale is grander in the original: O'Neill brags to an entire room full of celebrating PR hacks, where Russo merely brags to one congressman. I suppose what I love about this episode is the economy of its storytelling and how quickly it's sets up the key relationships. I love its willingness to show the true grime in politics. There's also a rich seam of humour that's entirely lacking in the remake. The best line is probably Francis rebuke O'Neil for his cocaine habit: the ironic detachment with which he says, "and I don't mean to be old fashioned, but isn't it illegal?" Brilliant.